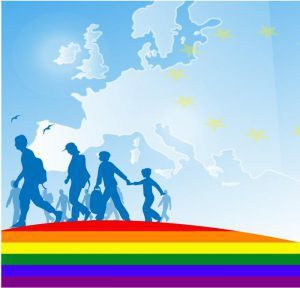 Sarajevo Open Centre invites you to the third educational workshop on legal aspects of migration and asylum based on sexual orientation and gender identity, named “Seeking asylum based on sexual orientation and gender identity”. The workshop will be held at the premises of CZM Kvart in Prijedor, April 27, 2019, starting at 11:00. The workshop is intended for all LGBTI people, activists and all other people who want to get involved and learn more about this topic. We organize this educational workshop with the Youth Foundation Schüler Helfen Leben from Berlin with the aim of informing and giving a closer insight to the LGBTI people about the challenges that they face in the process of seeking asylum and migration to the countries that enable it. Some of the questions we will try to answer are: What is asylum? How does it differ from other forms of migration? Sexual orientation and gender identity as the basis for seeking asylum; Which countries accept the stated grounds for seeking asylum and what is needed for a successful process? We will also discuss and try to get a better insight into the reasons for the departure of young LGBTI people in BiH, that is, what is necessary for them to change in order to stay in BiH and to share the experiences of people who already live outside. The departure of people from BiH in large numbers is a trend that has existed for years, and is conditioned by the frustration with the political and social state of people in their own country. These are the reasons that equally affect LGBTI people, and when we add additional issues that concern LGBTI persons such as physical and psychological violence, discrimination in school and at work, economic violence, lack of support from the family, and many others, it is understandable that on this issue, LGBTI people are in a much more difficult position than many of their peers. The mentioned workshop will last for one day, and we are able to cover the expenses of the trip and accommodation to a certain number of participants outside Prijedor. Number of places is limited. Working languages ​​are Bosnian, Croatian and Serbian. The deadline for applications is 24.4.2019 and you can apply by e-mail: darko@soc.ba or phone number 033 / 551-000. In the application it is necessary only to indicate your name and surname, place from which you are arriving and whether you will need accommodation and transportation. Contact person for all questions about the workshop is Darko Pandurević.